The color scheme of this one totally reminds me of the Twilight books by Stephanie Meyer. Skill Level: Another EASY project. 1. Use the pattern below to cut each pattern piece from it's corresponding piece of felt. You will need Adobe Reader to see and print it. It's free, and you can download it here. 2. Embroider around the black circle using a blanket stitch and white embroidery floss. 3. Embroider around each red flower using a blanket stitch and black embroidery floss. 4. Stitch around the edge and down the center of each white leaf using a running stitch and black embroidery floss. 5. 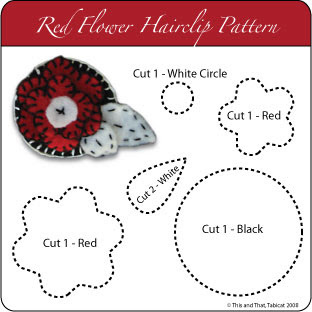 Place the small red flower on top of the large red flower, and then place both on top of the black circle. Center the little white circle on the small red flower and secure it by stitching an "x" through all layers. 6. 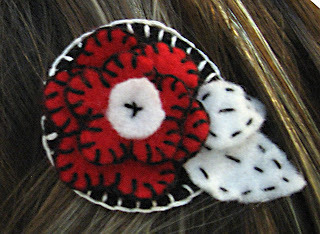 Sew the leaves to the black circle hiding the leaf-bases beneath the red flowers. This is adorable! Would you mind if I featured it on my Twilightations blog? It would be in a few weeks but I think it's totally appropriete! What do you think? If you're interested, if you could write up a small paragraph about yourself and email it to me. 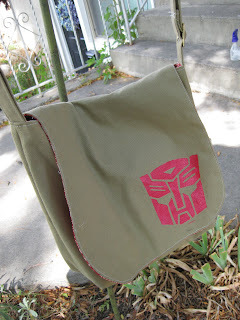 My email is found on the Twilightations blog too. Nice job!! Love this! So cute. Thanks for all of the info, you did an awesome job. I'm going to have to try this! Hi, my name is Cristina and I come from Portugal. I'm rookie in craft stuff, but I found your pattern really cute. I'm enlarged the pattern and made a brooch with different colours. If you check my blog you can see it for yourself. Thank u very much for sharing your ideas.